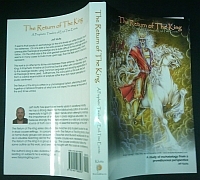 “The Return of the King” book is released. New, from ReturningKing.com, is The Return of the King: A Prophetic Timeline of End-time Events. Available from the author’s store or from Amazon.com. This work is written to a non-technical audience as a time-line study of biblical principles concerning remaining history. Chapters include pre-tribulational events, the tribulation years, the return of Christ as King, the Millennial Kingdom, the judgments of the dead and the final eternal abodes of all humanity and angelic creatures. As such, this work is comprehensive in its breadth concerning all future historical events noted in scripture, through the eternal abodes of Heaven and Hell. Being written in common language, this work is relatively concise for its subject matter, at 344 pages. All theological terms are defined and explained so that a lay reader can easily navigate the difficult field of biblical prophecy. The author is a Biblicist, believing that scripture, including prophetic scripture, is to be understood from a literal interpretive method unless the context demands specific attention to symbolic interpretation. To that end, this work will follow a rigid “biblical” approach to answering questions related to the end times. It is, in effect, a large-scale biblical course, written into book form for self-paced digestion. Teacher and Student editions are now also avaiable for this work. The Teacher/Student editions are condensed versions of ROTK which are in a manuscripted outline form for the purpose of classroom presentation of the material. Using the ROTK book as a guide, a teacher can prepare presentations for a roughly 20-hour study course on the subject matter. Student books are identical to the Teacher books, but with blanks to be filled in during presentation. The Teacher and Student versions are now available through the author’s e-store and from Amazon.com. Church groups can receive a discount code for the e-store by contacting the author directly through his website at www.ReturningKing.com and requesting a group rate. Group rates for 10 or more books will also be granted for the ROTK master book. The ROTK master book is a 6X9 paperback and the Teacher and Student manuals will be 8X10 with large print for laptop use in the classroom. Recently released, the author’s new work entitled “The Spirit World” details the progression of man’s (and angels’) progressive journey through the spiritual realms in scripture. This work is a systematized examination of Sheol, Hades, the Abyss, and various other-worldly terms which are used in scripture; commonly being mis-interpreted for lack of a thorough knowlege of their biblical definitions. The Spiritual Realms series at ReturningKing.com is a rough outline of this new book. 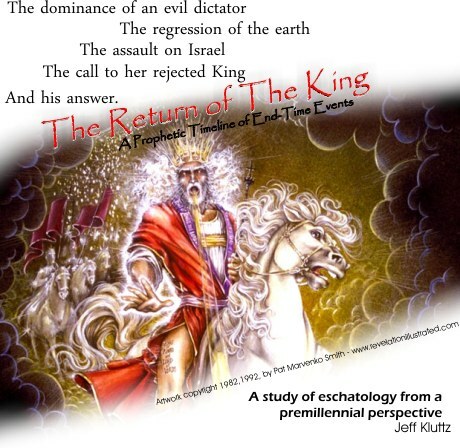 The Return of the King details the timeline of prophecy from the current day until the eternal order as depicted in the Bible. 5 Responses to “The Return of the King” book is released.